Plastic SCM blog: Welcome to the jungle! Note to readers: I strongly recommend reading this post while listening this. And now... for those about to Git... we salute you! 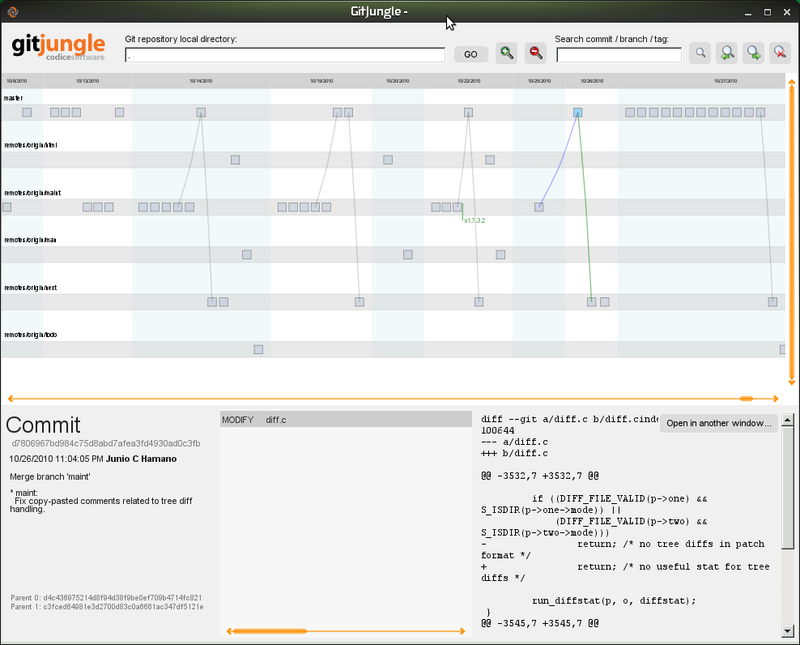 We’ve just released GitJungle, a small, beautiful Git repository browser using our Plastic SCM Branch Explorer (BrEx) visualization technology that basically lets you look at your Git repo from... well, a different angle. Simply go to our just released labs page, read a little bit more about it and then download the binaries (remember you will need Mono installed if you’re a Linux or Mac OS X user). And you get the beautiful graphics!! Warning - experiment zone ahead! We've just released the GitJungle beta! It's an experiment, it looks cool, it's usable, but it's not free of issues. If you find any... tell us! 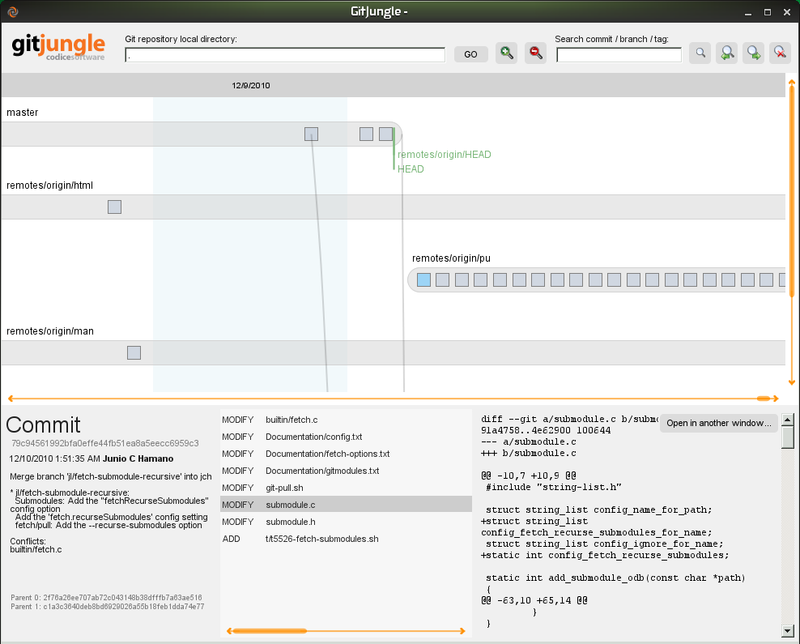 We've also used the same core technology behind the Plastic Branch Explorer, which shows history in a horizontal way instead of the vertical way GitK and other UIs use. Suggestions, hard critics and applauses are welcome! Why are we releasing a Git tool? We develop and sell Plastic SCM, the most powerful commercial DVCS to date, the one with the best visualizations, multiple database backends, integrated ACL security, superior branching and merging support... ok, let's cut the marketing speech!! Yes, we do focus on Plastic. However, developing GitJungle only took us a few days so, why not share it? But, answering the question - we're working on the next version of Plastic SCM and our goal is to make it more interoperable than ever, and two-way synchronization with Git will be one of the key features there. Also, Plastic SCM is a DVCS for companies and Git is totally focused on OSS projects, so why not collaborate? Git is teaching branching and merging concepts. Also, it’s educating the entire world about distributed development. This is fantastic for Plastic since we can expand and elaborate on these same concepts and practices while at the same time release a tool for software development companies based on these concepts (note: no, Plastic is not based on Git, we had a lot of hard work developing our own core, our own database layer, merge algorithms, security and all the funny things!). Just tried it on a TFS repo synced with git-tfs. Meh is the best expression. Not into having to give out my phone number for some free software...now it I had to pay for it, that would be a different matter. You can always lie with your phone number, but, come on guys! We're giving it for free, is such a big effort to enter 3 fields? I mean, you probably did it for your google account, didn't you?